The fragrances of Maui are all around you. Plumeria and mock orange scents fill the air. Enjoy this 4 bedroom, 3 bath home with A/C. Whether your party is small or large Hale Lanui will be perfect for you. 20% off for stays of 28 or more nights. You may purchase damage deposit waiver by going to www.vacationprotection.com. If you take insurance then the damage deposit is not required. Sleeps 8 comfortably. in addition to beds for 8 there is one queen sofa bed. Magnificent ocean view along with a private swimming pool, Jacuzzi and gas barbecue. The home is decorated in a casual tropical theme with lots of local art throughout. A/C in every bedroom , there is a king size bed in the upstairs master bedroom. Sofa standard sofa beds available in addition to beds in each bedroom. Also on the upper level is a game room with a pool table, large screen TV, DVD and a wrap around deck. Non-$smoking. 4 minute walk to Starbucks, WOW! Wonderful Milestone home: friends traveling together, multi-generations, graduations, weddings. Hale Lanui fits the bill for all of these. $375 cleaning fee (8 guests). $1,000 damage fee (damage fee refunded within 10 days of departure as long as no damage or excessive cleaning). Payment: $2,000.00 deposit at confirmation. Balance due 60 days prior to arrival except for holiday time when final payment due 90 days prior to arrival. We accept credit cards adding a 5% fee for US guests. Additional fees apply to out of the country guests. If renting for more than 28 nights one quarter of payment due at confirmation and balance due 90 days prior to arrival. Cancel policy: $500 cancel fee once funds are on account until 61 days prior to arrival (91 days for holiday season). No refunds if cancellation is made 60 days prior to arrival (90 days for holiday season) unless re-rented than $500 cancel fee applies. Travel insurance is recommended. Located next to the well known Kalama Park. Hale Lanui is minutes from the Cove Park for surfing and the famous Kamaole beaches for ocean swimming. You enjoy the quiet of a residential street but can walk easily to restaurants, Starbucks and groceries. Next to a wonderful walking path along the ocean where you can watch the fishermen and surfers. There is a resident manager living in a small cottage on the street side of the home should you need assistance or repairs during your stay. We absolutely loved staying at Hale Lanui. The house was amazing, spacious for all of our family, the beds were very comfortable, the kitchen was perfect for preparing meals for 9 people, and everyone loved the pool. The multiple patios gave everyone options for relaxation. Having 2 washing machines was also very helpful with such a large group of people. Being at the end of Halama Street offered us the most incredible view of the Kalama Park and Ocean. The house is perfectly situated in central Kihei and mere steps away from all the amenities which everyone really appreciated. The on site property manager, Jessica, was very quick to respond to any question or concern via text, which was great. We didn’t want to leave and my parents would love to come back, until next time. The pictures don't do this place justice, it far exceeded our expectations. You are steps from the water, next to the a beautiful clean park with tennis/ basketball courts and kids play structures. You are 2 minutes from the Kehei restaurants, grocery store and local kiosk (including the shaved ice cream we had to have everyday). The layout of the house is perfect for larger families wishing to spend a lot of time together. The outside eating area is simply amazing and a great place for meal time or simply to watch the sunset. The upstairs games area with pool table was a hit with our teenagers. Did I mention the amazing pool and hot tub in the gorgeous back yard. Owner and onsite manager are great. Answered all questions we had promptly and made us feel very welcome. If we ever go back, we wouldn't stay anywhere else. It was that good!!! Grocery and Dining are very close. Very nice clean home with a well stocked kitchen and amenities. Very pleasant experience. >> We ALL want to move there!!!! >> Thank you so much for sharing your BEAUTIFUL home with us and insuring that we had a GREAT vacation. Jessica was great...we arrived so much later than expected, but she was there and was so gracious. >> YOUR HOME HAD EVERYTHING WE WANTED....the landscaping was gorgeous...the pool, outdoor patios, lanai’s , kitchen, bedrooms...etc. no amenities lacking. LOVING my stay here at Hale Lanui!!! This is my second stay and I have thoroughly enjoyed both! I am poolside now, enjoying the sweet song birds and gorgeous garden! It’s so refreshing swimming in the clean salt water pool with the relaxing waterfall sounds. My own private paradise! We have vacationed here two years in a row and very much appreciate the beautifully decorated home with its great amenities. 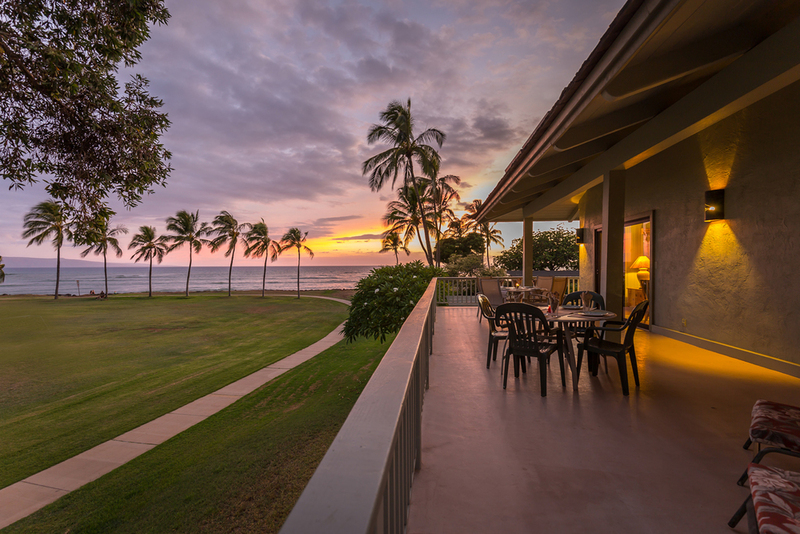 The location is such that one can walk the short distance (one and a half blocks) to the “Triangle” with its shops and restaurants or stay in taking advantage of the peaceful setting with is ocean views, incredible lanai’s, amazing kitchen, and poolside barbeque. The manager (Rodney) is resident on property and is very pleasant and approachable should one have any questions. 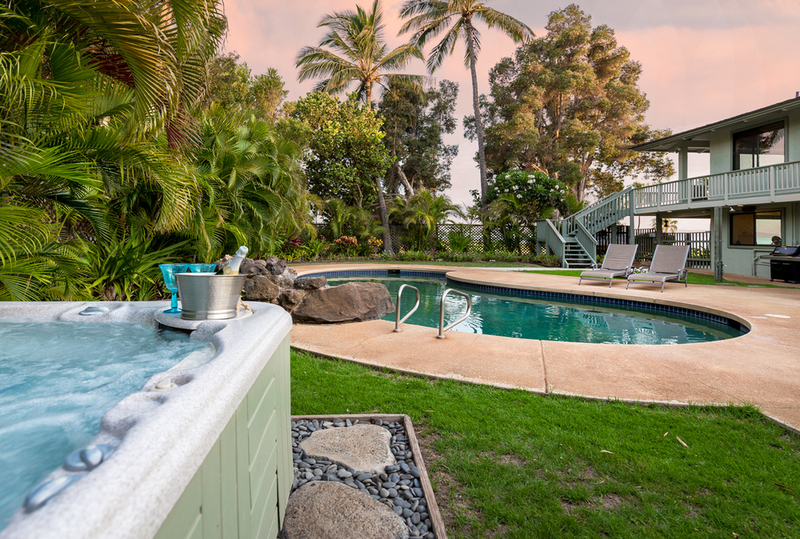 We had a delightful and magical stay at Hale Lanui. The salt water pool, deck, ocean breezes and wonderfully decorated and comfortable interior were delightful. Rodney (residential manager) was super friendly and helpful.